Film Crit Hulk Smash: Hurray For Wakaliwood - The Best Emergent Cinema On The Planet | Birth.Movies.Death. Discover the story behind the best action-comedies from an unexpected place. MOVIES SHOULD RARELY BE DEFINED BY THE CONTEXT IN WHICH THEY ARE MADE. EXCEPT WHEN IT MEANS EVERYTHING. FOR YEARS, A MAN NAMED NABWANA ISAAC GODFREY GEOFFREY (HE GOES BY ISAAC) HAS BEEN MAKING FILMS IN THE SLUMS OF WAKALIGA, ON THE OUTSKIRTS OF THE UGANDAN CAPITAL CITY OF KAMPALA. THESE FILMS HAVE BEEN MADE WITH PRACTICALLY NO MONEY, OFTEN LITERALLY COBBLED TOGETHER WITH WHATEVER LOCAL RESOURCES THEY CAN FIND. BUT THIS LACK OF RESOURCES HAS NOT IMPEDED HIS AMBITION OR SCOPE, BECAUSE ISAAC MAKES PASSIONATE, VFX-FILLED ACTION / GENRE FILMS. AND HE DOES SO IN THE SAME EXACT WAY A LOT OF KIDS MADE FILMS IN THEIR BACK YARD. BUT HULK CANNOT OVERSTATE THE DIFFICULTIES OF MAKING THESE FILMS IN THIS CLIMATE. WAKALIGA IS A PLACE THAT GETS ELECTRICITY MAYBE 3 DAYS A WEEK (AND THUS SHOOTING HAS TO BE PLANNED AROUND THE BATTERY LIFE FOR THE CAMERA). HE SHOOTS WITH WHATEVER EQUIPMENT HE'S BEEN ABLE TO SCROUNGE TOGETHER. HE TAUGHT HIMSELF TO EDIT AND AND DO EFFECTS PURELY THROUGH TRIAL AND ERROR. AND WHEN YOU LOOK AT THE AMBITION, YOU WILL SEE WE'RE TALKING ABOUT A SHEER VFX VOLUME THAT TAKES AN INSANE AMOUNT OF WORK. THE LEVEL OF COMMITMENT IS STAGGERING. FOR MANY YEARS, THE MARKET FOR THESE FILMS HAS JUST BEEN HIS OWN VILLAGE. ONCE THEY WERE FINISHED, HE WOULD GO AROUND SELLING COPIES OF THE MOVIE, BUT SINCE HE NEEDED HIS 80G HARD DRIVE TO BE CLEARED TO MAKE ROOM FOR THE NEXT FILM, OFTEN THE WORK WAS SAVED ON CHEAP KNOCK-OFF DISCS AND THAT ALONE. IT'S BEEN ESTIMATED THAT HE'S MADE CLOSE TO 36 FILMS BY THIS POINT, BUT MOST OF THEM HAVE BEEN LOST (IT REALLY REMINDS YOU OF THE OLD SILENT FILM ERA). BUT HE JUST KEEPS MOVING ON, MAKING FILMS, LOVING CINEMA, AND OPERATING THIS SMALL LITTLE ECOSYSTEM. TO THIS DAY, HE'S NEVER EVEN BEEN INSIDE A MOVIE THEATER. THE RULES JUST GO RIGHT OUT THE WINDOW WHEN YOU TALK ABOUT THEM, TOO. EVERY KNOCK YOU COULD MAKE ABOUT MISE EN SCENE, PACE OF EDITING OR SCENES GOING ON TOO LONG, ALL CRASH AGAINST THE ROCKS OF A LARGER REALITY: THESE FILMS ARE LEGITIMATELY ENTERTAINING. ISAAC AND HIS TEAM SEEM TO HAVE AN INNATE SENSE OF WHAT'S FUNNY ABOUT THEY WAYS HIS CINEMA COMES ACROSS. MUCH LIKE THE "SUEDED" FILMS OF THE UNDERRATED GEM BE KIND REWIND, THEY UNDERSTAND WHAT IS CHARMING ABOUT THE LOW-RENT STYLINGS, WHAT IS LEGITIMATELY FUNNY OR GOOD ABOUT WHAT IS ON SCREEN, AND ALSO WHAT IS TRULY GREAT ABOUT THE GENRE ICONOGRAPHY THEY ARE APING (ESPECIALLY HOW IT OFTEN CLASHES WITH THE REALITIES OF LIVING IN UGANDA). PUT SIMPLY: THESE FILMMAKERS ARE DEEPLY AWARE OF WHAT THEY ARE MAKING. BUT THE REVELATORY NUCLEAR WEAPON OF THESE FILMS IS THE USE OF "VJ EMMIE." APPARENTLY, IN A SOME AREAS OF AFRICAN MOVIE CULTURE THERE IS THE USE OF A "V.J. ', A PERSON WHO IS WATCHING THE SAME MOVIE YOU ARE AND MAKING COMMENTARY OVER IT. THE MOST OBVIOUS COMPARISON IS SOMETHING LIKE MYSTERY SCIENCE THEATER 3000, BUT IT'S ACTUALLY A BIT DIFFERENT. THEY DON'T JUST MAKE JOKES ABOUT THE FILM, INSTEAD THEY ARE REALLY THERE IN SUPPORT OF THE FILM IN EVERY WAY. FOR INSTANCE, SOMETIMES VJ EMMIE EXPLAINS WHAT'S HAPPENING AND WHO PEOPLE ARE ON SCREEN. BUT MOST OF THE TIME HE'S JUST TALKING ABOUT HOW FREAKIN' AWESOME THE MOVIE IS. THAT'S RIGHT, HE'S A HYPE MAN FOR THE VERY MOVIE YOU ARE WATCHING. AND SO GUNFIGHTS PLAY OUT AS HE SHOUTS "SUPA ACTION!" AND "EVERYONE IN UGANDA KNOWS KUNG FU!" IT'S SO SURPRISINGLY EFFECTIVE. IT JUST BREATHES LIFE AND UNDERSTANDING INTO EVERYTHING YOU ARE SEEING. LIKE THE CONTEXT OF HOW THESE MOVIES ARE MADE, IT SPEAKS TO THE CONTEXT OF THE MOVIES THEMSELVES. IT'S SO REVELATORY THAT HULK FEELS LIKE 30% OF ALL MOVIES COULD BENEFIT FROM IT (THAT IS NOT A JOKE. THERE ISN'T A SINGLE TRANSFORMERS MOVIE THAT WOULDN'T BE BETTER WITH VJ EMMIE COMMENTARY). SO BETWEEN THE SUEDED FILMMAKING APPROACH AND THE USE OF VJ EMMIE, HULK WANTS TO MAKE IT CLEAR THAT THERE'S A REAL, INATE UNDERSTANDING OF CINEMATIC LANGUAGE HERE. THEY UNDERSTAND HOW TO PLAY UP MOMENTS OF GRANDEUR, THEY UNDERSTAND HOW TO UNDERCUT ANOTHER MOMENT WITH A JOKE. IF AN EMOTIONAL BEAT COMES OUT OF NOWHERE OR DOESN'T WORK, THEY'LL CALL IT OUT. THE MOVIES END UP TOEING THIS PERFECT COMEDIC TONAL LINE THAT MAKES THEM FEEL LIKE A BLAST. THE REALLY ISN'T ANYTHING ELSE LIKE IT. 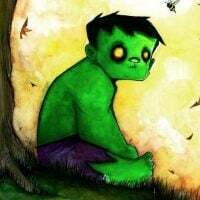 SO WHEN HULK HEARD WAKALIWOOD'S LATEST FILM BAD BLACK WOULD BE HAVING ITS WORLD PREMIERE AT FANTASTIC FEST, IT WAS THE ONE THING HULK HAD CIRCLED AS "CANNOT MISS"... AND OH BOY IS HULK GLAD FOR THAT. PUT SIMPLY: IT WAS ONE OF THE BEST SCREENING EXPERIENCES HULK HAS EVER ATTENDED. HALF THE AUDIENCE KNEW WHAT THEY WERE IN FOR, THE OTHER HALF WAS DISCOVERING THE FUN FOR THE FIRST TIME. ALAN HOFMANIS (AN AMERICAN WHO FELL SO IN LOVE WITH WHAT THEY WERE DOING, HE MOVED THERE AND STARTED PRODUCING AND ACTING IN THE FILMS) WAS ON HAND TO INTRODUCE THE FILM AND SPEAK TO MANY OF THE FILMMAKING REALITIES THAT HULK HAS DIVULGED HERE. AND OF COURSE, THE MOVIE ITSELF WAS A BLAST. THE WAKALIWOOD GANG EVEN PUT ENTIRE SPECIAL SECTIONS OF THE FILM CALLING OUT AUSTIN AND THE FANTASTIC FEST AUDIENCE (ONCE AGIN, JUST GOING FULL TILT INTO THE FUN META LANGUAGE THAT MAKES THESE FILMS SO CHARMING AND FUNNY). BUT EVEN ON THE PURELY AESTHETIC AND STORYTELLING LEVEL, YOU COULD SEE ISAAC GETTING SHARPER IN SOME WAYS. SCENES PLAY WITH MORE PURPOSE TO THE NARRATIVE BEING CRAFTED. THE PUZZLE OF THE PLOT REALLY COMES TOGETHER IN A FUN WAY THAT FEELS LIKE SLY CRAFT. AND IT HAS ONE OF THE MOST HILARIOUS NARRATIVE FAST-FORWARDS HULK'S EVER SEEN. TO TOP THAT, IT GENUINELY HAS THE FUNNIEST COMEDIC LINE OF THE YEAR FROM VJ EMMIE (YOU'LL KNOW THE ONE). HULK'S NOT EXAGGERATING. IT WAS SUCH A GOOD LINE THAT EVERYONE STOOD UP AND CLAPPED. IF THAT WASN'T ENOUGH, WHEN THE FILM WAS OVER ALAN BROUGHT OUT A CAMERA MAN AND INFORMED US THAT WE WOULD BE FILMMING A SCENE FOR THEIR NEXT MOVIE (A DISASTER HORROR FILM ABOUT EBOLA!) AND THUS EVERYONE IN THE THEATER HAD TO DIE OF EBOLA. IT WAS COMPLETELY AMAZING. YOU WILL NEVER SEE AN ENTIRE AUDIENCE FULL OF PEOPLE HAVE SO MUCH FUN PRETENDING TO DIE HORRIFICALLY. AND AS ONE LAST AMAZING BIT, THE AUDIENCE GOT TO SKYPE WITH ISAAC AFTERWARDS AND ONE BY ONE, MORE PEOPLE STARTED TO MAKE THEIR WAY TO THE SCREEN. HIS WIFE, KIDS, ACTORS. SOON IT FELT LIKE THE ENTIRE WAKALIWOOD COMMUNITY WAS JUST THERE AND SO HAPPY TO BE SHARING THEIR PASSION, TALKING, AND JOKING ON SCREEN. ... IT WAS GENUINELY MOVING. THERE'S A TERM GOING AROUND NOW CALLED "THIRD WORLD FILMMAKING" AND IT'S MEANT TO COVER THE SUM TOTAL OF D.I.Y. MOVIES BEING MADE IN THE MORE REMOTE PARTS OF THE WORLD. BUT HULK DOESN'T REALLY LIKE THE TERM. IT FEELS LIKE AN UNKIND TOURIST ANGLE TO SOMETHING THAT IS OFTEN SO MUCH MORE. THE REASON WE CARE ABOUT ISAAC AND WAKALIWOOD IS BECAUSE THEY ARE DOING GREAT WORK. THEY ARE MAKING SOMETHING THAT IS GENUINELY FUNNY AND ENTERTAINING. AND WE ARE RESPONDING TO IT AS FANS. WHICH MEANS IT'S AS SIMPLE AS ANY OTHER FANDOM ON THE PLANET. BUT BECAUSE OF THE INCREDIBLE CONTEXT OF HOW THESE MOVIES ARE MADE, IT IS SO MUCH MORE THAN THAT TOO. AND TO THAT POINT, HULK WANTS TO CONVEY JUST HOW MUCH WE CAN DO SOMETHING ACTIONABLE TO MAKE A DIFFERENCE. TO PUT THIS IN PERSPECTIVE: ALAN CAME TO THE SCREENING BECAUSE HE IS AN AMERICAN WITH A VISA. BUT ISAAC COULDN'T COME TO THE SCREENING BECAUSE UGANDA IS IN SHAMBLES. THERE'S NO UNIVERSAL ID SYSTEM. THERE'S NO SOCIAL SECURITY NUMBERS. UNLESS YOU ARE BORN IN THE UPPER ECHELON OF SOCIETY, YOU CAN'T REALLY LEAVE THE COUNTRY. BEING BORN IN WAKALIGA OFTEN MEANS HAVING TO LIVE THERE YOUR WHOLE LIFE. THIS IS THE REALITY FOR HIM. WAKALIWOOD IS THE BEST OF WHAT CINEMA HAS TO OFFER.